In 2001 Jim O’Neill, then chief economist at Goldman Sachs, coined the famous acronym BRICs, referring to Brazil, Russia, India, and China. He predicted that by 2050 these four economies would be the biggest contributors to global economic growth. O’Neill got two countries right: China and India. As of 2016, these two economies account for almost a quarter of global economic output, up from a tenth in 2001. According to the Prosperity Index, they accounted for over a third of the past decade’s growth in global prosperity. Meanwhile, Russia and Brazil continue to grapple with economic and political unrest, and contribute less to global economic output in 2016 than they did in 2001. What went wrong? The BRICs were chosen purely for their economic growth potential, and on this basis O’Neill was right to group them as he did. From the perspective of 2001, the BRICs showed a lot of economic promise: the demographic projections mostly showed labour force growth, their growth rates showed an ability to harness technological progress, and their investment rates were high. But non-economic factors do not only matter, more generally, for prosperity – they matter for economic growth too. Over the past decade, the countries that have been among the strongest performers in rising up the prosperity rankings have shared certain common foundations: high scores in Education, Governance, and Social Capital. Education makes people more productive and better able to lead prosperous lives; good governance provides the policy stability needed for growth and the freedom that allows people to flourish; and strong social capital built on high levels of trust oils the wheels of commerce and improves individuals’ wellbeing. Brazil’s Governance ranking dropped from 63rd to 74th place over the past decade, and while Russia’s improved, it still only ranks at 108th place. These are not the foundations on which economic growth, and still less prosperity, can be built. While the BRICs shared similarly promising economic foundations, their performance across these other pillars of prosperity varied, and it is this variation that explains their different trajectories. For example, Brazil’s Governance ranking dropped from 63rd to 74th place over the past decade, and Russia’s remains ranked at a lowly 108th. These are not the foundations on which economic growth, and still less prosperity, can be built. So which countries show the most promise now? We looked for countries that have performed solidly in the three foundational sub-indices – Education, Governance, and Social Capital; which have populations large enough to make a substantial contribution to global prosperity; and which are on an upward prosperity growth trend. These are the VIPPs: Vietnam, Indonesia, Poland, and the Philippines. Together, the VIPPs account for 6.6 percent of the world’s total population. The largest – Indonesia – alone accounts for 3.5 percent. As they are home to such large populations, growth in the prosperity of the VIPPs is growth in the prosperity of hundreds of millions of people worldwide. Prosperity growth in the VIPPs over the past decade is encouraging. 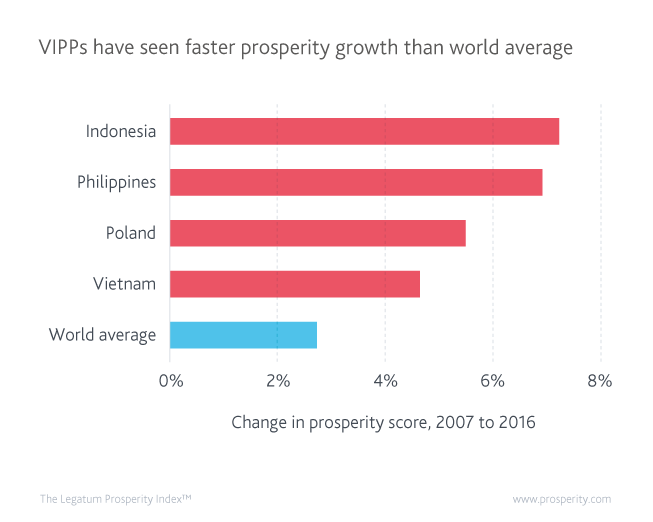 Indonesian prosperity grew by over seven percent, while Vietnam – the slowest of the group – grew by close to five percent. Meanwhile, the world average prosperity growth was close to just three percent. Maintaining such fast prosperity growth requires the foundations of good governance, social capital, and education. In this regard, we see that the VIPPs perform well. Their 2016 scores in Education are all above the world median score. In Governance, Vietnam is below the world median because it is not democratic, but otherwise it has reasonably effective governance. The remainder of the VIPPs score well above the world median. In Social Capital, Poland falls slightly below the world median, but the rest of the VIPPs enjoy high levels of social capital. A combination of large populations and positive prosperity growth trends makes the VIPPs well placed to drive global prosperity growth over the next decade. Their solid foundations in education, governance, and social capital may help them avoid the fate of the BRICs.